But because most Interior employees have been furloughed during the record-setting partial shutdown that began Dec. 22, none of the comments that Interior invited starting Dec. 28 has been posted for public consumption (Greenwire, Dec. 28, 2018). The result is a kind of regulatory shadow play, with some kind of action occurring behind a screen even as the dialogue is held back on a time delay of indefinite duration. "While there's an open proceeding, there's nobody actually working at Interior to answer questions, gather information, accept comments, and start reviewing submissions," Jeremy Nichols, climate and energy program director at WildEarth Guardians, said in an email. "It's like we're sending letters to an abandoned house." Citing the partial shutdown, WildEarth Guardians and more than 150 other organizations and individuals late yesterday urged Interior to extend the public comment period by at least 120 days. The request was accompanied by an expression of frustration. 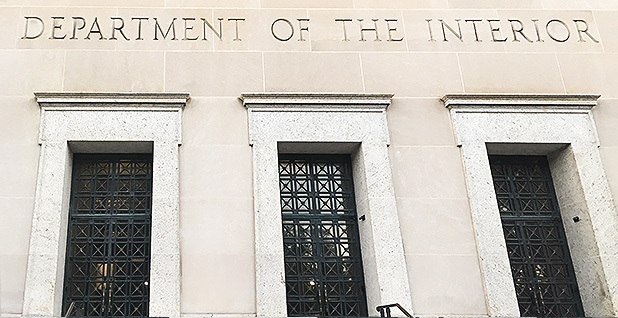 "Although organizations have submitted Freedom of Information Act requests to obtain more background records regarding the proposed revisions, the Interior Department is not currently accepting Freedom of Information Act requests," the group letter noted. Emails sent to the Interior official identified as the point of contact for the proposal, moreover, receive an automated reply that she is "not authorized to work during this time." Before the furloughs hit, Interior officials said the FOIA changes in question would help the department adapt to changing circumstances. "Exponential increases in requests and litigation have made updates to these regulations a priority," Interior stated. Between fiscal 2016 and fiscal 2018, incoming FOIA requests to Interior jumped 30 percent, from 6,428 to over 8,350. Some bureaus and offices have been "hit especially hard," the department stated, with the Office of the Secretary's FOIA office seeing a 210 percent increase since 2016. Under the new FOIA proposals, the department declares it "will not honor a request that requires an unreasonably burdensome search or requires the bureau to locate, review, redact or arrange for inspection of a vast quantity of material." In addition, the changes would allow Interior to "impose a monthly limit for processing records ... in order to treat FOIA requests equitably by responding to a greater number of FOIA requests each month." A handful of reporters for news organizations including E&E News, Politico and the Pacific Standard, among others, as well as advocacy groups like the Western Values Project, have been particularly active FOIA requesters, a review of Interior's recent FOIA logs shows (Greenwire, Dec. 11, 2018). Last October, for instance, FOIA requests were filed for everything from calendars and congressional correspondence to Interior Department headquarters visitor logs and a list of all applications installed on Deputy Interior Secretary David Bernhardt's cellphone. The new proposal would allow Interior to demand to know how FOIA requesters who identify themselves as educators, students or journalists intend to use information that is provided to them, with higher standards applied. "Distributing copies of released records, electronically or otherwise, does not qualify as using editorial skills to turn the raw materials into a distinct work," the proposed rule states.